The Washington Nationals are still hoping to re-sign Bryce Harper. The 26-year-old outfielder, who has spent his entire career with Washington, became a free agent after the season. Nationals general manager Mike Rizzo told reporters on Tuesday the team have already "made attempts to re-sign" their star. "He's our guy," Rizzo said (via MLB.com). "So we're looking forward to seeing what can transpire." The Nationals made an "aggressive offer" to Harper on the last day of the 2018 season, according to a report from the Washington Post. Harper, however, rejected the proposal, the report said. "We took advantage of our exclusivity late in the season [to negotiate with Harper]," Rizzo told the Post. "[But we] couldn't reach a deal." 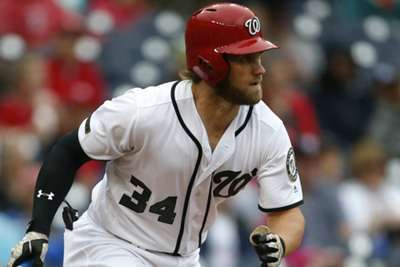 Harper slashed .249/.393/.496 with 34 home runs and 100 RBIs in 159 games with the Nationals in 2018. He is a six-time All-Star and won the MVP award in 2015. The St Louis Cardinals and Chicago White Sox, among others, have also reportedly expressed interest in Harper so far this offseason.